The SouthernBiotech Mycoplasma Detection Kit is designed to specifically detect potential Mycoplasma contamination in cell cultures. The kit incorporates polymerase chain reaction (PCR) to amplify the conserved 16S ribosomal RNA coding region within the Mycoplasma genome, thereby providing an extensive, highly sensitive, and efficient detection method. Carefully determined primer sequences cover three genera of Mycoplasmatales (Mycoplasma, Acholeplasma, and Ureaplasma) which allows the kit to detect over 95% of potential cell culture infections. The PCR technology in the Mycoplasma Detection Kit is fast (results are typically obtained in less than 3 hours) and easy to use. The kit is also highly sensitive and can detect as little as 2-5 femtograms of Mycoplasma DNA in 100 µL of test sample supernatant. Eukaryotic and bacterial DNA from cell culture supernatant is not amplified by the kit. 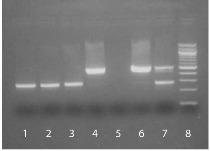 A sample cell line infected with Mycoplasma will generate a PCR product between ~448 bp to ~611 bp on an agarose gel, depending on the type of Mycoplasma present. A positive control (M. orale, 503 bp) is included to validate that the PCR amplification process has occurred as well as to confirm the size of the PCR product obtained in test samples. An internal control is also provided to eliminate potential false negatives associated with PCR inhibitors. 1. Lamb SA, Rahman MM, McFadden G. Recombinant myxoma virus lacking all poxvirus ankyrin-repeat proteins stimulates multiple cellular anti-viral pathways and exhibits a severe decrease in virulence. Virology. 2014;464-5:134-45. 2. Frampton GM, Ali SM, Rosenzweig M, Chmielecki J, Lu X, Bauer TM, et al. Activation of MET via diverse exon 14 splicing alterations occurs in multiple tumor types and confers clinical sensitivity to MET inhibitors. Cancer Discov. 2015;5:850-9. 3. Modur V, Joshi P, Nie D, Robbins KT, Khan AU, Rao K. CD24 expression may play a role as a predictive indicator and a modulator of cisplatin treatment response in head and neck squamous cellular carcinoma. PLoS One. 2016;11(6):e0156651. 4. Campos-Gomez J, Ahmad F, Rodriguez E, Saeed MF. A novel cell-based assay to measure activity of Venezuelan equine encephalitis virus nsP2 protease. Virology. 2016;496:77-89. 5. Wang X, Shaw DK, Hammond HL, Sutterwala FS, Rayamajhi M, Shirey KA, et al. 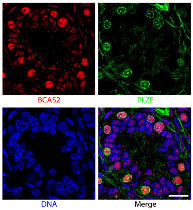 The prostaglandin E2-EP3 receptor axis regulates Anaplasma phagocytophilum-mediated NLRC4 inflammasome activation. PLoS Pathog. 2016;12(8):e1005803. 6. Baird JR, Feng Z, Xiao HD, Friedman D, Cottam B, Fox BA, et al. STING expression and response to treatment with STING ligands in premalignant and malignant disease. PLoS One. 2017;12(11):e0187532. 7. Melvin JA, Gaston JR, Phillips SN, Springer MJ, Marshall CW, Shanks RM, et al. Pseudomonas aeruginosa contact-dependent growth inhibition plays dual role in host-pathogen interactions. mSphere. 2017;2:e00336-17. 8. Wagner RD, Johnson SJ, Danielsen ZY, Lim J, Mudalige T, Linder S. Polyethylene glycol-functionalized poly (lactic acid-co-glycolic acid) and graphene oxide nanoparticles induce pro-inflammatory and apoptotic responses in Candida albicans-infected vaginal epithelial cells. PLoS One. 2017;12(4):e0175250. 9. McGee D, Smith A, Poncil S, Patterson A, Bernstein AI, Racicot K. Cervical HSV-2 infection causes cervical remodeling and increases risk for ascending infection and preterm birth. PLoS One. 2017;12(11):e0188645. 10. Sprague L, Lee JM, Hutzen BJ, Wang P, Chen C, Conner J, et al. High mobility group box 1 influences HSV1716 spread and acts as an adjuvant to chemotherapy. Viruses. 2018;10:132. 11. Crittenden MR, Zebertavage L, Kramer G, Bambina S, Friedman D, Troesch V, et al. Tumor cure by radiation therapy and checkpoint inhibitors depends on pre-existing immunity. Sci Rep. 2018;8:7012. 12. Razidlo GL, Burton KM, McNiven MA. Interleukin-6 promotes pancreatic cancer cell migration by rapidly activating the small GTPase CDC42. J Biol Chem. 2018;293:11143-53. 13. Pishas KI, Drenberg CD, Taslim C, Theisen ER, Johnson KM, Saund RS, et al. Therapeutic targeting of KDM1A/LSD1 in Ewing sarcoma with SP-2509 engages the endoplasmic reticulum stress response. Mol Cancer Ther. 2018;17:1902-16. 14. Bryant JD, Sweeney SR, Sentandreu E, Shin M, Ipas H, Xhemalce B, et al. Deletion of the neural tube defect-associated gene Mthfd1l disrupts one-carbon and central energy metabolism in mouse embryos. J Biol Chem. 2018;293:5821-33.